2009 archive..... click on the image to see the finished item. George's Father complaned about his fingers being cold when working in the garage. A perfect excuse for another pair of "Dashing" mittens - pattern from Knitty.com - brother to the famous "Fetching". 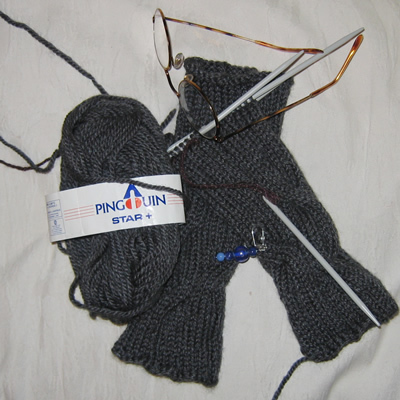 I used some vintage wool from my stock room... Pingouin Star+ (50% Wool/ 50% Acrylic: 85m/93yds per 50g: 18sts x 24rows to 4 ins on 4½mm needles) in a practical working shade of grey. A quick fix birthday gift of "Fetching" dashed off in time for Cathy's birthday. I used one 50g ball of Rowan Tapestry, (70% Wool, 30% Soybean Protein Fibres; 120m/131 yards; 22sts x 30rows to 4 ins on 4mm needles). I have finally found a lovely scarf pattern in the right gauge to use the beautiful cashmere yarn that Alison bought me as a gift (some time ago now). It always seemed just too special to start anything with. Anyway - here it is - a smoke ring cowl in 100% cashmere yarn from Nash Farm Alaska. An excellent opportunity for me to make a Fiona Morris jacket using her special techniques; lucky I had recently been on her workshop. 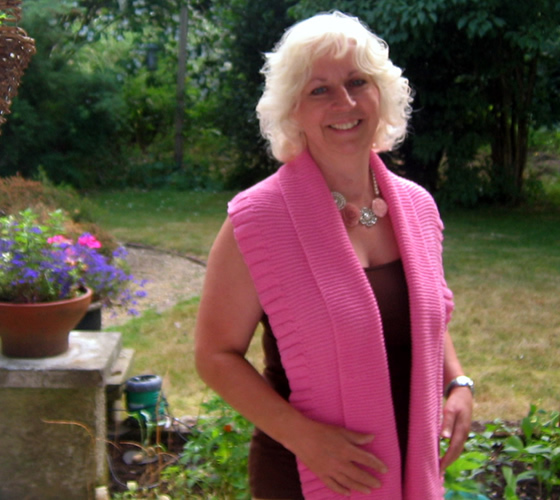 Sheila met Fiona at Ally Pally and chose this cardigan. We then went to great lengths to find the exact same colour as Fiona had on display - in the discontinued Wendy Fusion yarn (50% Wool/ 50% Acrylic: 16sts x 20rows to 4 ins on 5½mm needles). This loose fitting style and random colours would be great for handspun (albeit a bit thick). From Ysolda Teague's collection Whimsical Little Knits 1. 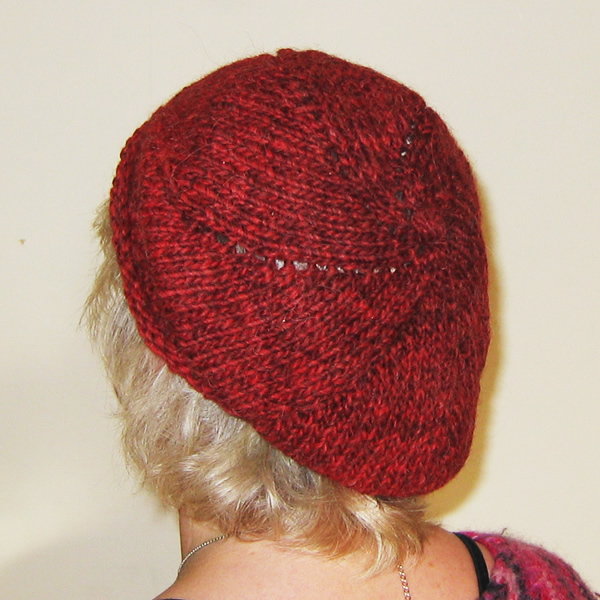 It's called a slouchy hat - and it surely is! I used Sirdar Peru (which I think is now discontinued), colour 302 Pablo. It's a chunky yarn, 50% wool/10% alpaca/40% acrylic, and knits to a tension of 14sts and 19rows to 4 inches on 6mm needles. I devised these mittens to go with Featherbed from Louisa Harding's Little Cake. 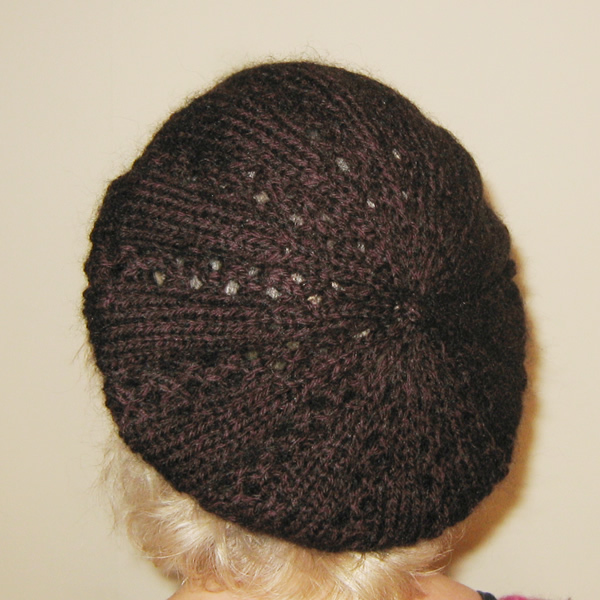 I used Rowan Kid Classic, colour 852 Peat (as below) with 4mm needles and cable lace stitch. Pattern available in Pattern of the Month for December 2009. This is Featherbed from Louisa Harding's Little Cake. I used Rowan Kid Classic, 70% Lambswool 26% Kid Mohair 4% Nylon. 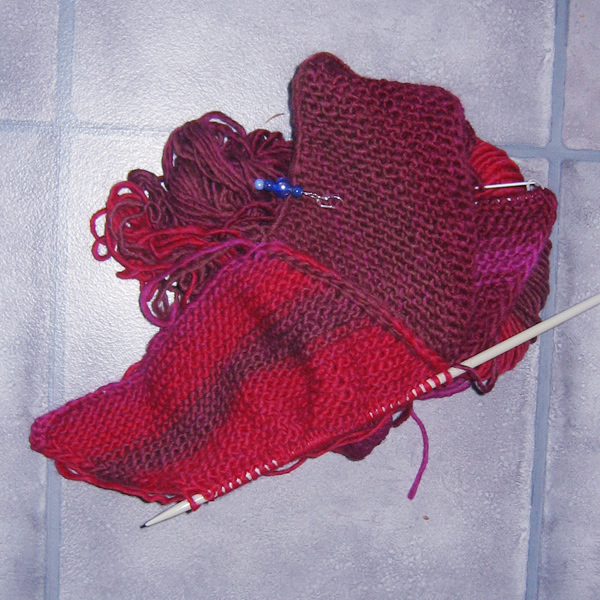 Knits to a tension of approximately 18sts x 24 rows to 4 inches using 5mm needles. I was very smitten with this rich dark brown colour 832 Peat (with a hint of burgundy). I would have preferred to use the recommended Thistle yarn but there is no chocolate brown (requested by user) in that range. 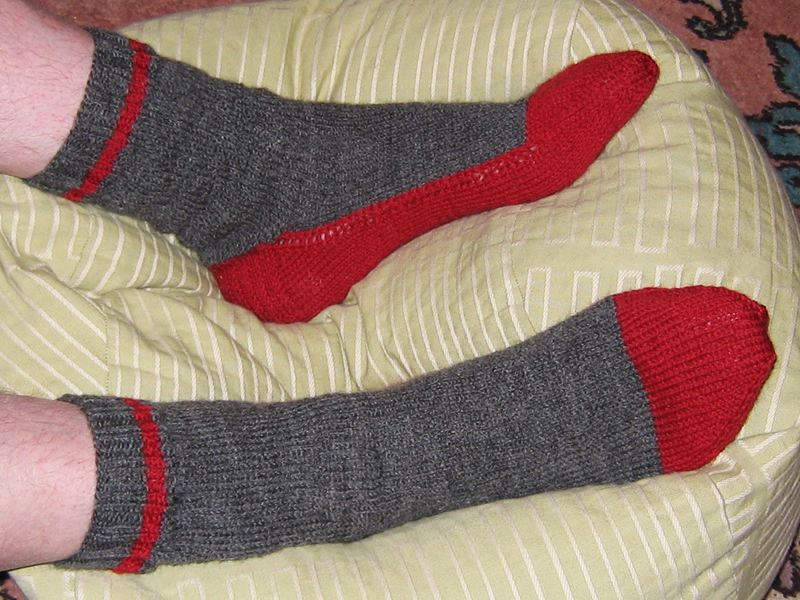 Recently I was handed back the bedsocks I gave G's father as they had holes in the heels. I dutifully mended them, but thought this a good excuse to give him another pair. 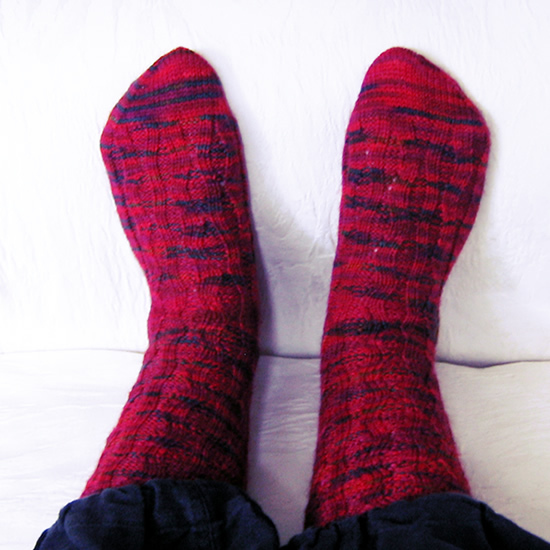 These are double knit socks in the "antibacterial" Phildar Oxygene, colour Neptune, - 25% wool, 35% chlorofibre, 40% acrylic - and knits to a tension of 23stsand 30 rows to 4 inches on 3½mm needles. Knitted using Regia (75% wool,25% polyamide) 4 colour yarn in shade 5180 "Oslo". This is a fine weight sock yarn which knits to a tension of 30 sts and 42 rows to 4 inches, and has a yardage of 210m to 50g. 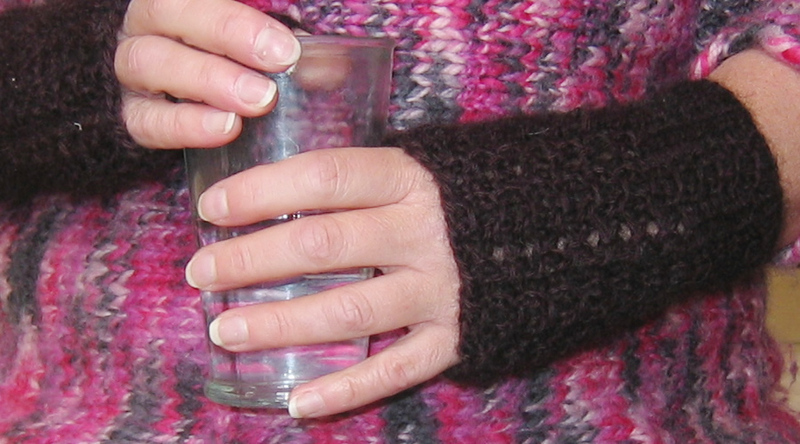 Knitted using Admiral Ringel (75% wool,25% polyamide). This is a fine weight sock yarn which knits to a tension of 30 sts and 42 rows to 4 inches, and has a yardage of 210m to 50g. 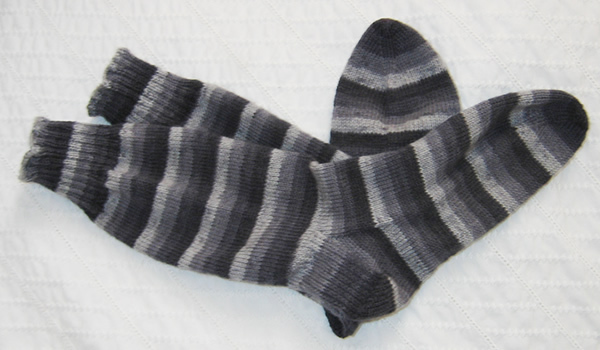 The yarn is beautifully soft and the self-striping pattern seems to be simple stripes in shades of grey. I purchased the yarn in a bargain box at IKnit. The Knitter magazine, supported by Rowan, have set up the Macmillan Comfort Blanket campaign. The idea is to knit blanket squares with your knitting group, - in my case, just me. 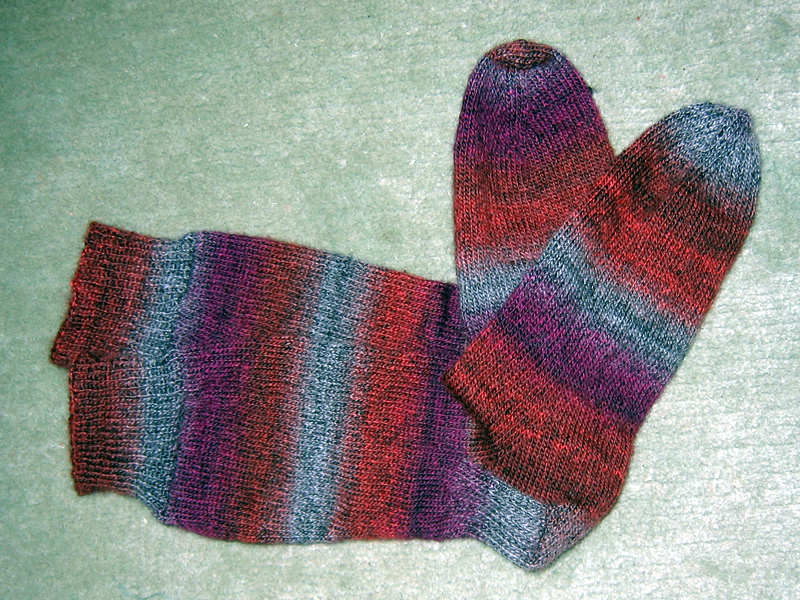 Knitted in Phildar Oxygene and Frenesie wool blends. The blankets will be used to support and raise awareness of Macmillan's campaign to freeze out fuel poverty for cancer patients. I am an enthusiastic supporter of Macmillan and other cancer charities involved with care of cancer sufferers (like Maggie's). See POM September 2009 for more details. 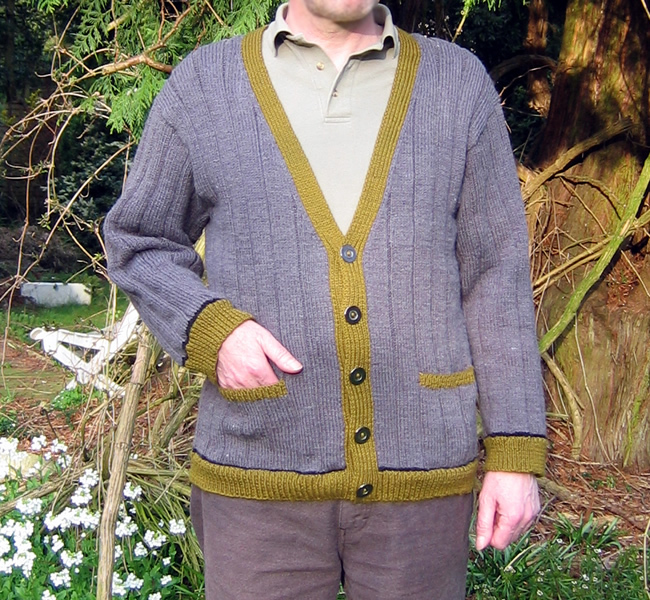 Knitted by special request for a light-weight cardigan to wear on summer evenings in France. I have been planning this for some time, selecting a vintage pattern about a year ago, not daring to show it to G as the styling on the cover beggars belief. The yarn used is 25 year old Phildar Luxe which knits to a 3ply tension (32sts to 4 inches). Luxe is a "baby" yarn - 85% acrylic, 15% wool [50g; 201m/219yd], but beautifully soft, yet robust and practical. I originally bought the yarn to make myself a sophisticated knitted sweater and skirt in fine wool - so I have plenty left - and the buttons are also from my collection- though simple modern plastic ones. Cover photo from Debbie Bliss Magazine No 2. Knitted in Prima in colour 07 Pink (one shade darker than the one on the magazine cover). 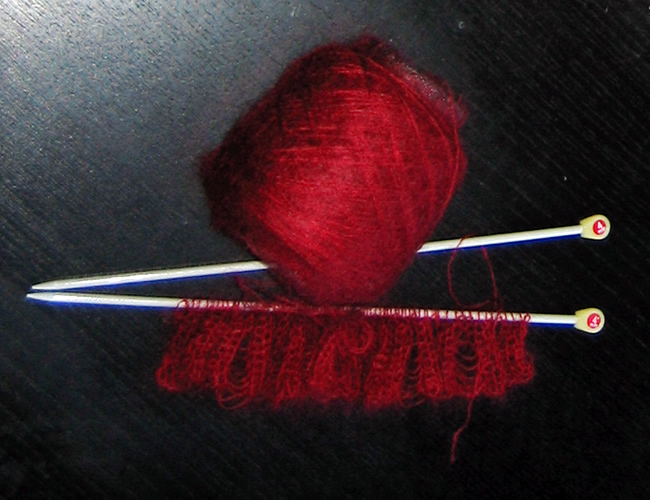 Knits to a DK tension. Yarn is 80% bamboo, 20% merino wool [50g; 115yd/106m]. I used some pure silk yarn [100g skein; 600m], that I purchased from Knit Witches at Woolfest. The colour is "stormy skies" which has turned out to be a little more purple than I was expecting - but lovely nonetheless. The tension is fine and the Ishbel scarf has turned out a little smaller than the pattern intended, perhaps - but fine for me. 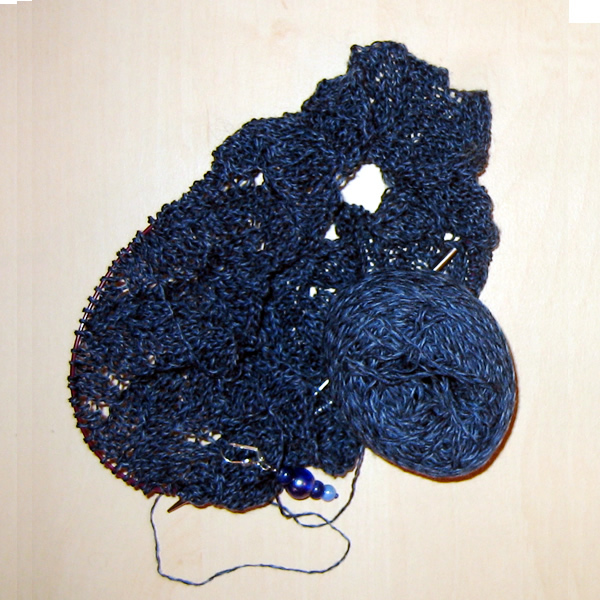 The skein should be sufficient yardage for 2 scarves (which is why I did not attempt to increase the size to match the gauge). Pattern based on the "Fetching" pattern from Knitty.com. 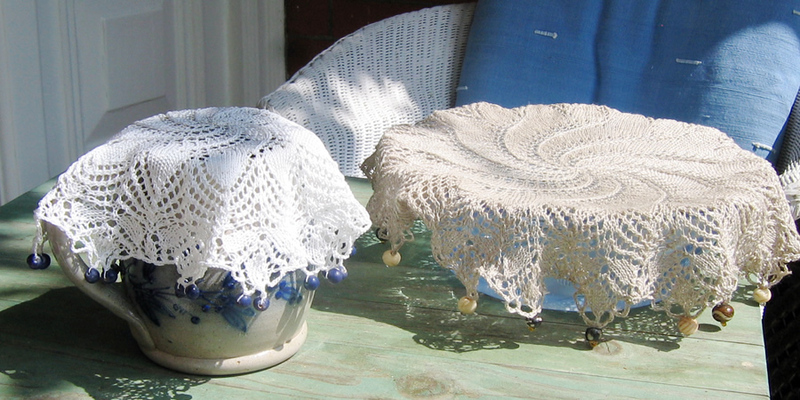 Vintage knitted doilies using Anchor linen No 20 in shade 920 and Coats Mercer Crochet 20 in white. On-line pattern available in Pattern of the Month August 2009. 1950s sports socks knitted using Sunbeam St Ives Sock wool in Navy shade 3110, 80% wool, 20% nylon [50g; 200yd/182m], and Jaeger Baby Merino 4 ply in Princess shade 126, 100% merino wool, [50g; 200yd/183m]. On-line pattern available in Pattern of the Month June 2009. I am using handspun Suffolk, dyed with KoolAid in bright colours - just because I can! George surprised me by demanding that these are socks for him - I wonder of he regrets it now?. 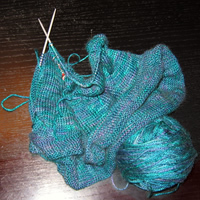 The gauge works out to a "4ply" weight (about 28sts to 4 inches). 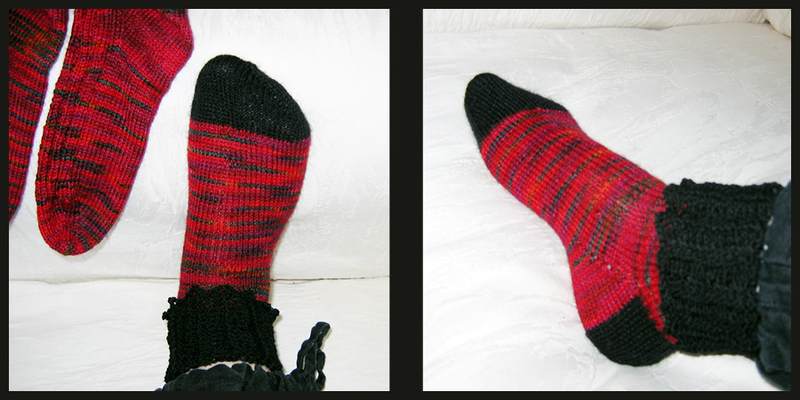 Pattern based on the Web of Wool sock pattern. This is Anouk (longer version) from Louisa harding's book Nouveau. I took some trouble selecting a neutral shade that might suit me, and go well with my summer clothes. This is shade 100 Old Cream in RYC Bamboo Soft, 100% bamboo [50g; 112yd/102m]; I like the slight sheen, and soft texture of this yarn. It knits to a tension of 25sts x 30rows to 4 inches. I am using handspun Suffolk, dyed with KoolAid, and blended with a proportion of acrylic fibre (20-25%). Mainly this was a colour blending experiment. The yarn is a little hard due to over spinning, but has worked out well. The colour scheme is muted. 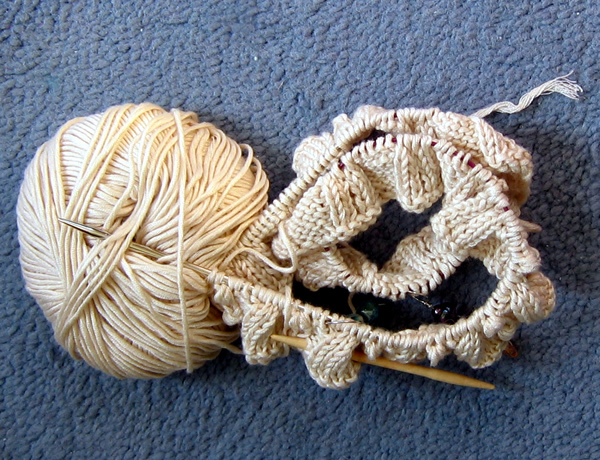 The gauge works out ot a fine double knitting (about 26sts to 4 inches). 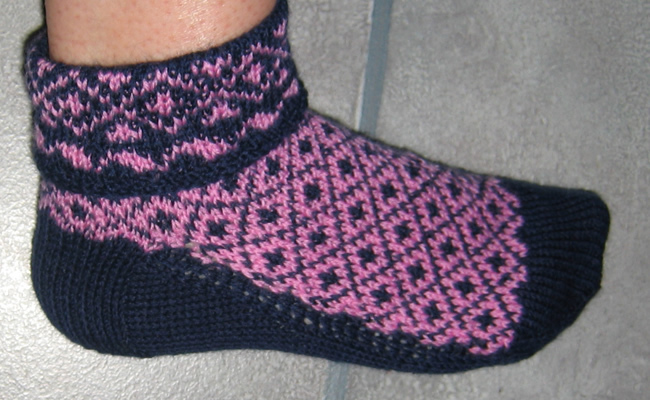 Pattern based on the Web of Wool sock pattern. I am using handspun from a bag of lama fleece that my sister bought for me at the Royal Show last year from Catanga Llamas; due to my variable spinnning, it varies in gauge.... The pattern is from A Fine Fleece, and is clearly very adaptable, though I started with the colourway shown in the book and then had to reverse my colours as the brown is spun thicker than the cream - the pattern works better with the garter bands thicker than the lace pattern. A neat summer top from the 1980s. As I remember the styles from the eighties, I remain uncertain as to how it will work out; it may be a little bulky for a summer top - but that's what it's meant to be. 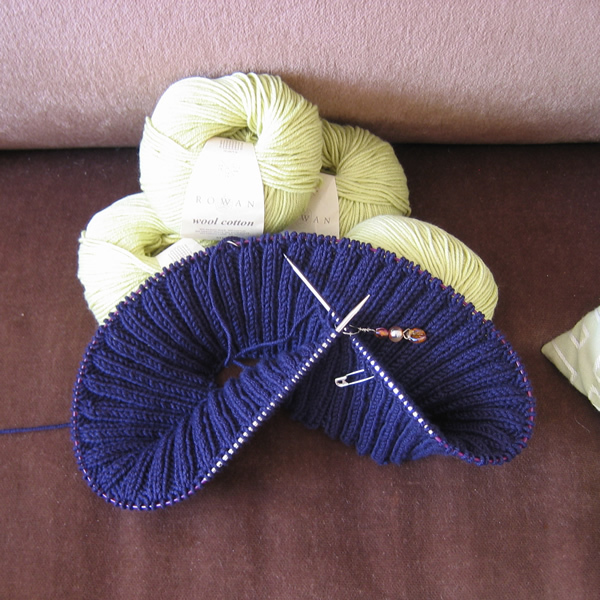 I am using Rowan Wool Cotton, in shades 901 Citron and 909 French Navy; 50% merino wool, 50% cotton [50g; 122yd/113m. On-line pattern available in Pattern of the Month May 2009. 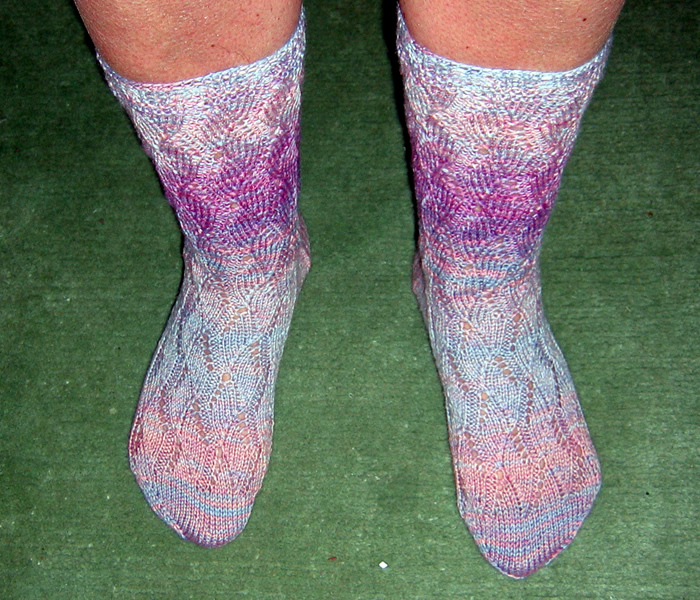 These are Meida's Socks by Nancy Bush from the Interweave Knits Sock book. I usedthis pretty pattern to knit up what can now be referred to as stash yarn (as I have had it for over a year); it's Phildar Lambswool [50g; 145yd/134m], which is a fine DK, in colour Printemps 221. 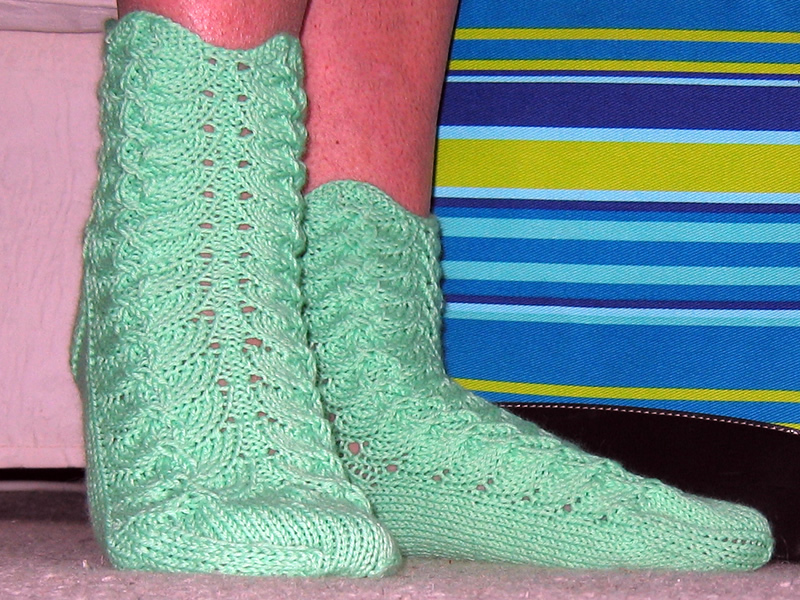 The gauge is right for the pattern and I like the result but I think they look nicer in the suggested cream cotton. 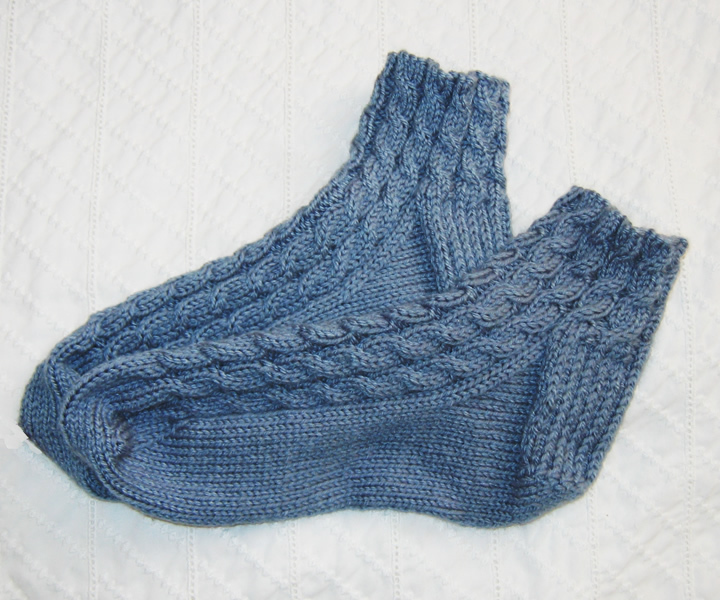 I really love this pattern by designer Evelyn Clark from the Interweave Knits Sock book. I have used it to knit up my Knitpicks Sock Blank yarn, which I dyed using Dylon all purpose dye in shade of lavender. 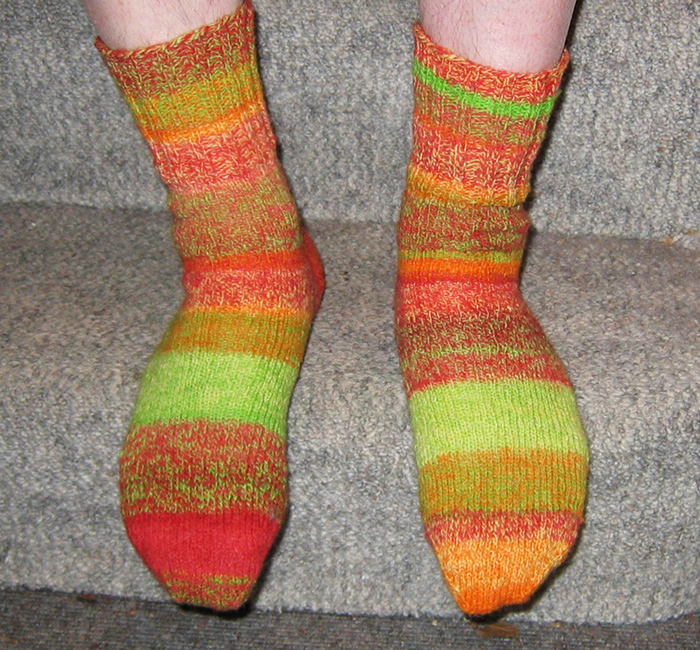 The socks used 70g of the 100g [462 yards]. 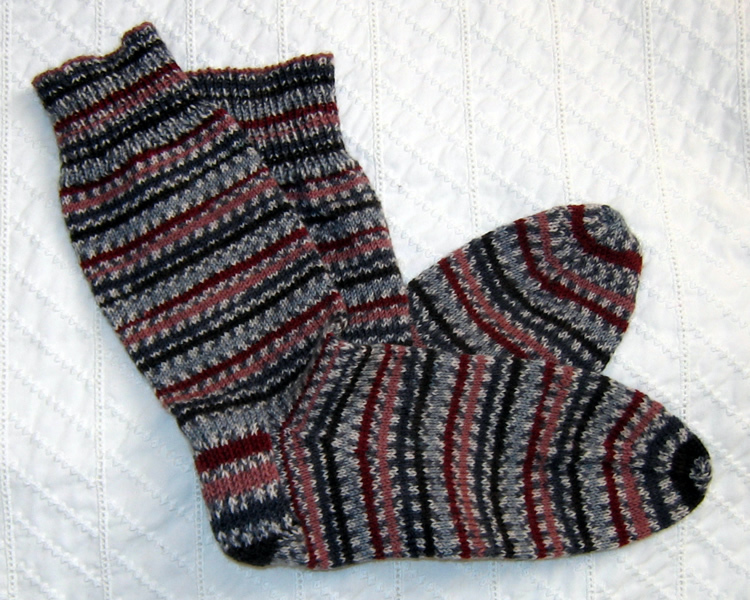 I so much like the Wildfoote yarn that I could not bear to waste a scrap of it so I knitted these socks (improvising) from the Interweave Knits Sock book. They are Ann Budd's Lace-Cuff Anklets. The toes and heels are in left over Sirdar Town and Country sock yarn, the ribbed ankle is in "Midgely and Catton Ltd Homestead (90 % wool)" and the lace part is in Jaeger Botany 3 ply - all black shades..
Alison gave me this exquisite fibre for Christmas along with a pattern for a beautiful scarf. She saw the finished item knitted up but there is no photo included, which adds to the pleasure, because the surprise continues as you knit. The yarn is Artfiber's Tsuki , 60% Kid Mohair, 40%Silk, [40g skein; 515yds], and the pattern is Artfibers Vertical Drop Stitch Scarf. Another pretty top from Kim Hargreaves' book Nectar. Intended to be knitted in Rowan 4 ply cotton, I am using some "Seriously Gorgeous" yarn, 35% Baby Camel, 35%Silk, [100g skein; 400m], that I purchased from Knit Witches at the Ally Pally show last year. It seems to be working out to the right size so far, but I never quite know until the item is finished. I seem to have problems with things for myself that are intended to be tight fitting, in that I knit them in too large a size. 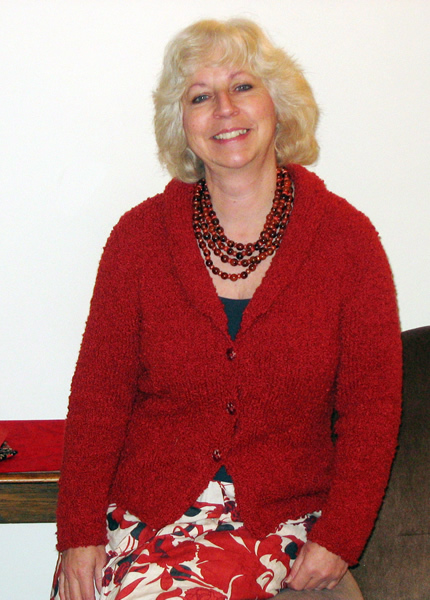 Delightful Kim Hargreaves cardigan from her book Thrown Together. Intended to be knitted in Rowan Felted Tweed, 50% Merino, 25% Alpaca, 25% Viscose/Rayon, [50g; 189yd/175m]. 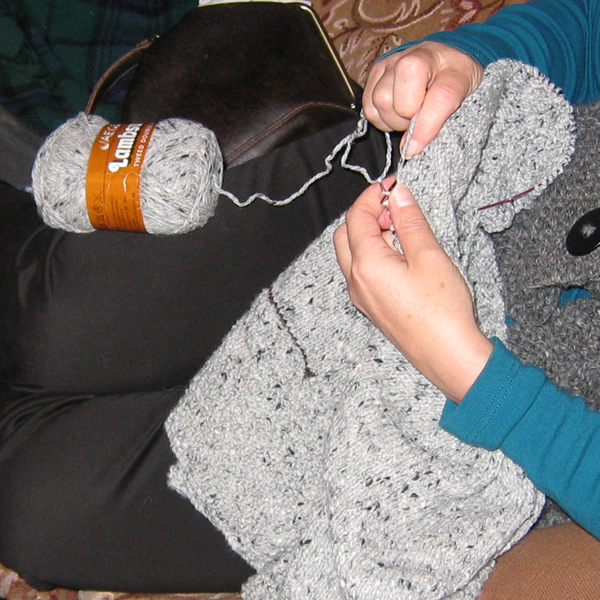 I am using a pale grey vintage DK Jaeger Lambswool Tweed that I have had in my possession for about 20 years. It is a pure wool which is much denser than the Rowan, so 10 balls was just enough to complete it. I think the result does not quite have the ideal drape for this design. 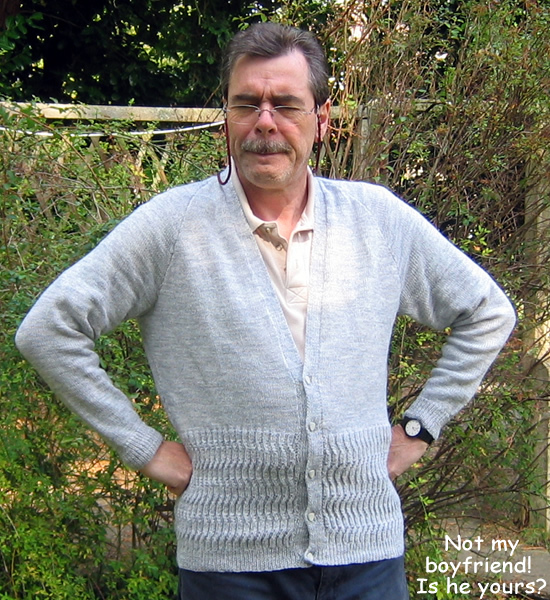 Requests for a "lighter weight cardigan" have resulted in my knitting this light grey ribbed example from the book Classic Knits for Men. It is in a DK yarn though - so not so very light weight - RYC Cashsoft DK, in shades 518 Thunder and 523 Lichen, 57% extra fine merino, 33% microfibre, 10% cashmere, [50g; 142yd/130m]. As always there is a tiny though elegant single row of another colour (black) - so I used an oddment of Patons Clansman DK (100% wool) for this. Sally was published on Magknits - but unfortunately this site is no more and the patterns have disappeared with it; hopefully Anna will post the pattern again on her own site. Socks for me, using yarn that I purchased from Yarndogs in Los Gatos, while staying with Alison in 2007. The yarn is the Brown Sheep Company's Wildfoote [50g; 215yd/197m], colour SY-300, Ragtime, 75% wool 25% nylon, and knits to 28sts to 4 inches on 13 (2¼mm) needles. I was seduced by the colour, and would have bought more and knitted something larger than socks, but they had only two balls left - so socks it is. Finally they have turned out to be... the Mock Wave Cable Socks from the Interweave Knits Sock book that I was given for Christmas 2008. Debbie Bliss design from her "Simply Soft" book (2005). Cowl-necked plain cardigan knitted in Cashmerino Astrakhan (50g balls; 70m/76 yards), shade 06 (dark red). 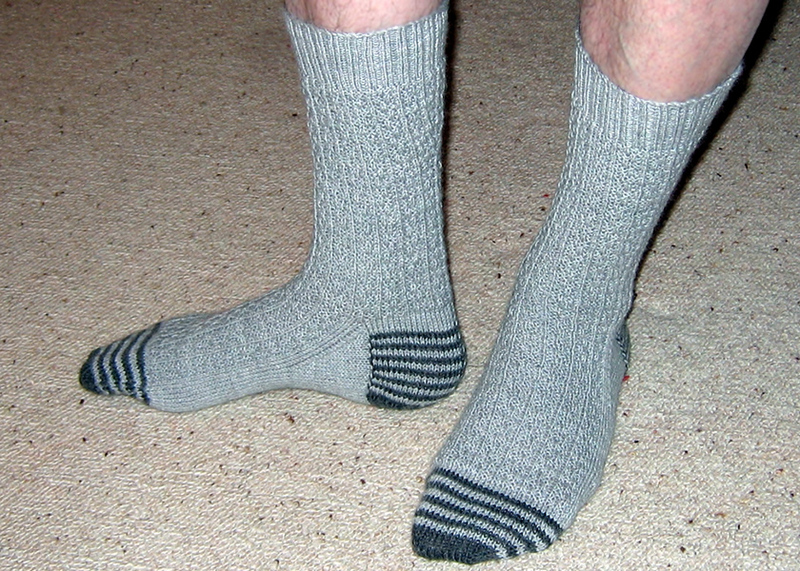 This is a soft blend of Merino wool (60%), microfibre (30%), and cashmere (10%), which knits as an Aran weight. 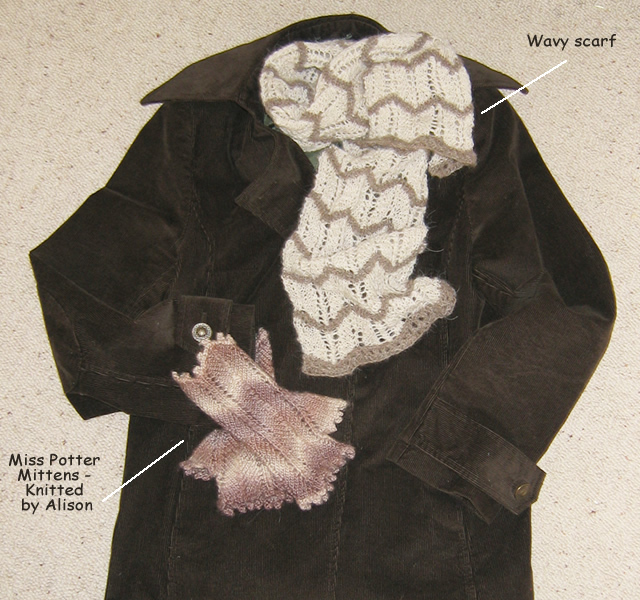 I actually adapted this pattern to knit a straight front edge by combining it with "Shawl collared jacket" from the same book.